Don't be fooled by the massive cover-up of the Y2K problem! The Government says that they solved any problems with the Millennium Bug and that nothing serious happened. Fools! The new millennium doesn't even begin until 2001 - so we haven't had a chance to get the full impact. Jan. 1, 2000 was just Phase One of the Y2K disaster - but the real impact will be in 2001. The quick fixes for this year will be of little help later! And can we really believe the Government and its controlled media when they say there were no Y2K disasters this year? Just ask the many terrorized citizens whose cars were destroyed by thousands of gallons of foam when they tried to get automatic car washes just moments after the new year began! Or ask the people whose clothes were shredded in violent rinse cycles at out-of-control laundromats. But the cover-up is even worse than that: there is was a potentially deadly terrorist connection revealed now, for the first time, one the home page for JeffLindsay.com. We are still at risk. The lessons of ancient Egypt are all the more relevant as we approach the real new millennium. There's still PLENTY OF TIME to get hysterical! Don't relax - begin hyperventilating today. idiot before Hathor, Goddess of the Funny Hat. In the original figure above, Hathor is wearing a stylized CD-player on her head. CD's were called "Luminary Disks" in that day, and are often mistaken for depictions of the sun by ignorant "scholars" today. Further, Hathor is receiving sacred hardware gifts from Maat, including what appears to be a cellular phone and a computer with a monitor (keyboards and mice were considered "unclean" in Egyptian religion of the day and typically were not depicted, though it is understood that Hathor will later have her servants bring ritually cleansed peripherals for her use). Shockingly, Establishment scholars have deliberately altered this work, allowing only the touched-up form on the right to be published. They have suppressed or altered many works of ancient Egyptian art because their stale theories leave no room for the truth: ANCIENT EGYPT WAS WIRED. Yes, it hurts our modern pride to think that all the glory of our computer age was experienced thousands of years ago on another continent - but our pride cannot change the truth! OK, so Egypt had computers around 1400 B.C. But what's this talk about a Minus Y2K Bug? Minus Y2K refers to the year Minus Two Thousand A.H. (-2000 A.H.), where "A.H." stands for Anno Hegirae (Year of the Haj or Hegira). Of course, Egypt, being a Muslim country, uses a calendar based on the year of Mohammed's sacred pilgrimage to Medina known as the Haj or Hegira, which took place in 622 A.D. The year Minus Two Thousand A.H. is 1378 B.C., the year that Moses led the Israelites out of Egypt. How did the ancient Egyptians know to use the future Haj as the basis of their calendar? Simple. In the Muslim faith, of course, Mohammed was a prophet, so such things were accepted as prophecy. The amazing but virtually true story of the Minus Y2K disaster takes place at the end of the year Minus 2000 A.H. - or "00" for short, using the two-digit convention that had served ancient Egyptian programmers so well for nearly nine decades, ever since computers first were produced in Minus 2089. The problem occurred at the transition to the year Minus 1999, or in computer terms, at the transition from the computer year "00" to "99". Relatively few modern Biblical scholars or Egyptologists are willing to recognize that ancient Egypt used electronic technology and computers in much the same way that we do. Part of this failure is due to the radical loss of computer and electronics technology that occurred when Minus Y2K struck, leaving relatively little evidence of Egypt's former technological greatness. But human pride, as I've discussed above, is the other factor. But for those willing to accept the truth, a few of the world's foremost scholars have amassed convincing evidence of the technical greatness that once belonged exclusively to Egypt, pointing to temple carvings and papyrus scrolls that appear to describe such ancient devices as a battery, a hovercraft, an electric toothbrush (a favorite of Ankhohuputhet, father of Hunk-Amen Ra), a nuclear reactor, and a videorecorder assembly repeatedly flashing the Egyptian hieroglyphics for the phrase "ps-jdh," meaning "one dozen hours." Most of these technologies were eradicated when the clock ran out on Egypt's great Silicon Age at the beginning of the year Minus 1999. Peoples of the world, learn this lesson from history! The Y2K Bug that threatens the modern world is nothing new. In fact, it may well prove to be a repeat of the disaster that leveled ancient Egypt, once the world's most technologically advanced empire. Not only did Minus Y2K set Egypt back for several thousand years, but it caused multiple "miraculous" events that catapulted a lowly Hebrew man named Moses to fame, giving him a reputation of, well, Biblical proportions, and enabling him to free thousands of Hebrew slaves. The Hebrews, of course, were legendary for their computer skills, but had been reduced largely to slavery. Their company, the one that largely started the Silicon Age, Israeli Business Machines (IBM), had been the victim of a hostile takeover by PharoahSoft, and now even project leaders and LAN administrators of IBM were forced into abject slavery - you know, life in small cubicles without adequate break time and unfair performance reviews by narrow-minded Egyptian managers. Quotas, objectives, and quality criteria were changing daily. Worst of all, they were all forced to sign broad non-compete agreements that kept them from ever working for anyone else again. Talk of rebellion was in the air, but any attempt at rebellion would have been futile without the inspired leadership of the programmer named Moses. He was suave, good looking (closely resembling Charleston Heston), and notoriously hard working, sometimes going non-stop as long as 40 days and 40 nights, eating and drinking almost nothing except an occasional Lotus Cola. He was also a favorite of PharaohSoft's CEO, Amen-Hunk-Ra himself (whose name, by the way, literally means "Portals [or Gates] of the Divine Will," or, in abbreviated form, "Will Gates." Though accused of brown-nosing, Moses' ties to the Pharaoh proved invaluable. And Moses was a visionary - even a prophet, some would say - who could see the Minus Y2K problem coming. What others might have seen as a disaster, he saw as an opportunity to bring freedom to himself and his fellow slaves. Recognizing the potential impact of the impending Minus Y2K disaster, Moses sent encrypted e-mail to his fellow Hebrews explaining the potential problems - and the opportunity for freedom. The Egyptian taskmasters had no clue about the bug, and Moses meant to keep it that way until he was ready. With over two years of secret warnings from Moses, the Hebrews had stocked up on essential goods and had their own computer systems converted to Minus Y2K compliant forms. Then, with only a few days before the bug was to strike, Moses approached the Pharaoh and made bold demands for his people, threatening disaster unless the Pharaoh agreed. Moses demanded promotions, stock options, increased break time, more vacation days, formation of a programmers union, cancellation of the non-compete agreement, and on-site child care and exercise facilities. Plus, casual attire was to be permitted every day of the week. Moses knew the Pharaoh would never agree to all that, but he wanted to negotiate down to what his people really wanted: cancellation of the non-compete agreement. They wanted their own corporation, not to be slaves to PharaohSoft. Thus Moses's real agenda was simple: LET MY PEOPLE GO! As Moses expected, the Pharaoh was outraged. He called Moses a snake, Moses called him a bigger snake, then the Pharaoh said all of Moses' staff were snakes - things got ugly fast, but both were all smiles when the photographers showed up. "We have had meaningful negotiations with our valued Hebrew friends," the Pharaoh's press secretary announced. But Moses could see through the hollow talk. As planned, he was ready to back up his threats against Egypt. Speaking directly to Hunk-Amen-Ra, Moses finished with this warning: "Egypt will soon suffer from a series of plagues. These will be a warning to you to let my people go." Then he turned and walked away into history. Turning to the largely accurate Biblical record, let's review the plagues that would finally free the Hebrews. On the last day of the Egyptian Year Minus 2000, Egypt, the "Land of Lovely Tomatoes" (the official tourism slogan of that year, in fact), was resting peacefully. Its hundreds of tomato sauce and ketchup processing factories along the Nile were producing record quantities of fresh, delicious products. But at the stroke of midnight, production shrieked to a halt. Millions of gallons of tomato products were suddenly identified as being 100 years old (Minus 1999 was mistaken for Minus 2099 because of the Minus Y2K problem). Product that old was unable to get by even the laxest of Middle Eastern standards, and thus had to be dumped into the Nile, turning the river to blood. The First Plague was on its way. The thick organic pastes dumped into the Nile caused clogging of many waterways, resulting in upstream flooding and the creation of numerous expanded ponds. Further, the organic waste wiped out many natural predators of creatures like tadpoles, allowing millions more frogs to mature than had ever happened before. Soon the entire countryside within 10 miles of the Nile was hopping with frogs. Ever tumbled dried your laundry with an amphibian thrown in? It was not a pretty site. Plague Two had leaped onto the pages of history - and into many people's laps. With the Nile polluted with organic wastes far exceeding allowable BOD levels (BOD = biological oxygen demand - a measure of the amount of organic matter in water that can deplete oxygen), the delicate balance of aquatic ecosystems was disrupted. Millions of pounds of dead fish rose to the surface of the river to be deposited on its banks, fueling explosive population growth in insect species, including the loathsome Scarab Beetle, which symbiotically spreads the eggs of "Nile lice," a pernicious insect whose numbers are normally small. But with the ecosystem disrupted, it soon would flourish and torment millions of Egyptians, just a few days after the frogs became a nuisance. The Biblical records fail to mention the beetle plague, which was just as annoying as the associated lice. Pharaoh's media consultants respond by putting a positive spin on the beetle problem, first by declaring Scarab beetles to be a desirable protected species and then upgrading them to the level of sacred. The abundance of sacred beetles is a good omen, declared the Pharaoh in his State of the Dynasty speech. Irritated citizens were not convinced, and his popularity rating dropped a full 5 points overnight. Plague Three had struck - and struck where it hurts. In fact, the Scarab Beetle would become the symbol of the Minus Y2K Bug that brought down Egypt and its dynasty at the time - a symbol that would later be revered by the lords of the next dynasty who benefitted from the disaster. For now, suffice it to say that the Third Plague left people itching for more stable technology. Maggot-infested rotting flesh of fish and other aquatic animals soon hatched huge swarms of river flies that would bite and infect humans - count this as Plague Number Four - but the symptoms weren't manifest yet. Ramses brand fly repellent was introduced by the Pharaoh's magicians (we call them marketers today), but the product was banned in response to rumors spread by agents of Moses, saying that it caused sterility and warts. The stalwart Pharaoh responded by issuing fly whips to his staff, many of which still grace the walls of Egyptian temples in timeless art. Meanwhile, another minor Minus Y2K glitch struck the Egyptian dairy industry. Automatic milkers regulated the flow rate of milk withdrawn from cattle, regularly checking the elapsed time versus the incremental amount of milk collected. When controllers hit the Minus Y2K transition (mercifully delayed by several days due to a programming error), it suddenly seemed that minus 99 years lapsed over a single short time interval. The positive amount of milk withdrawn from the cows over an apparent time interval of negative 99 years gave a negative flow rate. The controllers work to return the apparent flow rate to its normal positive value, which required a huge negative amount of milk, or in other words, a massive flow reversal. Pumps maxed out trying to pump the expected 99 year output of milk back into the cows over a 10-minute period. For many cows, the result was explosive. The Egyptian dairy industry was largely wiped out, the Pharaoh's household was reduced to using goat milk, and ordinary people were forced to eat cereal dry out of the box. Plague number 5 had run its course. The records here are contradictory. One scribe reports that a pathogen carried by Nile lice resulted in eruption of severe skin lesions among humans, while official releases from the Pharaohs house pin the blame for a rash of dermatological problems on Ruben and Sons Pharmaceuticals, where a Minus Y2K glitch in automatic labeling equipment caused the nations largest distributor of vaccines to send out live herpes virus mislabeled as flu shots. But not only was there confusion over what caused the boils and bains, there was widespread confusion and unrest when afflicted citizens couldn't get a straight answer from the medical community to a question that plagued almost everyone: just what are bains anyway? The best most HMOs could do was to offer a slogan: "No bain, no pain." True, but not helpful. People turned to alternative medicine, including a far-out cure suggested by one quack doctor: the mystic curative power of pyramids. The Pharaoh, not normally a gullible man, was desperate and initiated a massive building program, one that would become popular with other future leaders as well. Plague number six proved to be more than just skin deep, also bringing with it social unrest, naive faith in quack medicine, and widespread pyramid schemes. Egyptians in that era placed great faith in their local weathermen, whose predictions were generally accurate and generally the same: "warm and sunny today, warm and sunny tomorrow, warm and....". Good weather was a sign of favor from the gods, and good weather predictions were omens of good things to come. Unfortunately, the Minus Y2K bug led to a 100-year error in the data for recent weather conditions that had to be entered into the national supercomputer for weather predictions. At first, the bad data had little effect, but the error began accumulating such that after a few days, the predictions became totally chaotic. On a Tuesday evening, as millions of Egyptians watched the evening news for the next days' weather forecasts, national panic erupted when the weatherman predicted not "warm and sunny" weather but wild temperature swings - first subzero, then flaming hot, then subzero again. Sounds like "hail and fire," said the startled weatherman as he read fresh printouts from the national supercomputer. This was a bad omen. People locked themselves at home, businesses shut down, schools was cancelled for a week, and the GNP took another major drop. The next day was actually warm and sunny, but the harm had already been done. Plague Seven cost several billion dollars, and the Pharaoh's approval ratings dropped 13% - another unlucky omen. The "Hunk-Amen-Ra Live Forever in Glory First Nuclear Power Plant" had shut down at the first sign of trouble as Minus Y2K struck. "No harm was done," explained scientists and managers to nervous reporters. Though it might take weeks to make it completely Minus Y2K compliant, the public was assured that there would be no possible threat now that the factory was completely disabled. Unfortunately, the radioactive cooling water in a secondary backup line was released when a fire started in a testing lab. The fire melted a pipe support and caused the pipe to buckle and then break. Cause of the fire? A programmable microwave overheating, trying to pour 99 years of energy all at once into a camel burger. Five hundred gallons of radioactive water then spilled into a farm field, contaminating a local species of grasshopper. Moments later, what once were 2 centimeter-long insects grew and grew and grew, becoming roughly two to three feet in size, and HUNGRY! Like an eerie scene from a Hitchcock movie, thousands of giant mutant locusts rose into the air and headed toward human settlements, looking for anything they could eat. Egyptian crops were wiped out, along with a lot of nice wardrobes, draperies, and upholstered furniture. The insects knew no bounds, wrecking billions of dollars of havoc on an already crippled economy. Meanwhile, Moses had made plans for a company party for former IBM employees, who soon would be free of PharaohSoft's shackles. But a Y2K bug that even got past Moses caused his on-line order for 50 grams of horseradish to become 50,000 kilograms. Horseradish odor was all over the Hebrew settlement - and this seemed to repel the locusts. During the short lifespan of the voracious locusts, only Egyptian households were afflicted. The Hebrews would later make horseradish an important part of their Passover feasts in the future. Authorities at Pharaoh Power and Light were celebrating their success in averting Minus Y2K problems. In spite of the nuclear power plant shut down, the oil-burning and camel-chip burning plants were still producing power without serious glitches. The programmer in charge of the seemingly successful anti-Minus Y2K effort, Aaron, the brother of Moses, had received massive bonuses from the Pharaoh - literally mounds of gold and gems - for helping at least one part of the empire avoid any ill effects from Minus Y2K. But Aaron, acting under the direction of Moses, had simply set back the operating date of all control systems and computers by 20 days. Minus Y2K was still trudging relentlessly toward Heliopolis, but 20 days behind schedule. Aaron had ensconced with the loot and was urging family members, especially Moses, to pack up and head for Silicon Dioxide Valley in the Sinai, where lucrative tax breaks (40 years tax-free, thanks to a deal negotiated with the help of the Sinai Better Business Bureau) could give Israeli Business Machines a much needed boost. Then came the night that the lights went out in Egypt. Failed control systems led to massive power surges throughout the power grid. Control systems failed and trashed the generators producing hydroelectric power from the Nile - but not before the power surges swept across the nation, destroying most electronic equipment connected to the Egyptian power grid. Computers, radios, trash compactors, lava lamps - the whole technological and cultural foundation of the world's most advanced empire - was decimated in a flash. But before all that happened, Moses had hacked his way into the Egyptian National Bank system and transferred most of the electronically accessible wealth of Egypt into Hebrew accounts, plus put his own picture on the PharaohSoft Web Page, further humiliating Hunk-Amen-Ra. Between the electronic devastation and financial disaster, Egypt would be set back by several millennia. The Egyptian IRS had worked hard to be Minus Y2K compliant, but with so little time the effort was futile. All records of income, land holdings, crops, and other forms of wealth were suddenly erased, appearing to be 100 years too old to be of any interest. But the Egyptian IRS needed offerings and needed them urgently to meet their quotas and appease the gods and bankers. The only records of potentially taxable family possessions that managed to survive were records of firstborn sons. A decree was issued, and thousands of IRS agents raced through the night imposing their bloody tax. Ever sensitive to potential complaints and wishing to be customer oriented, the IRS worked to prevent double taxation by marking the homes of already-taxed families with a dab of blood on the doorway. Families who had already marked their doorways with blood, even if from an animal like a lamb, were spared. Moses the Hacker knew of this from IRS e-mail he had intercepted. Ordering thousands of lambs at discount prices - all charged to PharaohSoft, he had prepared his people to be delivered from this lethal plague. Sadly, the newly corrupted Egyptian IRS databases now failed to give special status to the Pharaoh's own son, treating him as just another number. The overzealous agents should have wondered what a commoner was doing living in the royal palace, but the IRS didn't exactly attract the smartest people to its ranks. When the Pharaoh came home to find his own son literally taxed to death, it was finally more than he could stand. In a rare moment of sentimentality, the Pharaoh decreed that Moses and his people were exempt from the non-compete agreement. They could go anywhere, anytime, just stop these plagues! Further, he ordered that the IRS had to become kinder and gentler - but first all current tax collectors, IRS middle management, and their entire non-Hebrew MIS (Management Information Services) department were to be executed. Israel rejoiced and began packing up for their long-awaited exodus from slavery. Actually, many of the Egyptians felt like celebrating, too. The planned wave of IRS executions made the entire plague ordeal worth the pain. Many Egyptians were so glad to see the IRS suffer that they gave a portion of their expected tax savings to the Hebrews to hasten their departure. It was only hours later when MIS officials begged for mercy and argued that all the plagues could be traced to Israeli forces. Much of the problem was due to inadequate hardware - or deliberately sabotaged hardware! - produced by Israeli Business Machines (IBM) before the takeover. The hardware was said to be designed with the Minus Y2K bug built in. And even non-Israeli hardware was failing not because of any problem with Egyptian computers and Egyptian software, but because of sabotage from Israeli hackers like Moses, who had already hit the road. The Pharaoh was livid. A goon squad of MIS forces (known for bloodthirsty viciousness) were sent out with the Pharaoh's army to attack and destroy the Hebrews before they left the country. And all affected computer systems were to be trashed and burned in a massive offering to Egyptian gods. In fact, for good measure, all computer systems were to be destroyed altogether. Technology was a bane, not a boon, to the Kingdom of Egypt. No more! The army of Pharaoh with most of his MIS forces were joined by nearly all of the empire's programmers and computer geeks, all anxious for vengeance on the people who caused the crisis that was about to cost them their careers and their hobby. This massive army knew precisely where Moses and his people were, having bugged Moses's walking stick with a location transmitter. The army took their course guided by an advanced global navigation system. Unfortunately, a Minus Y2K bug in their navigation system directed the Egyptian army in the middle of the night to walk right into the waist deep water of a portion of the Hunk-Amen-Ra Canal of the Gods, a major public works project that was slated to be the Eighth Wonder of the World. Sadly, the canal would be abandoned after Minus Y2K caused the complex system of locks to open and shut randomly and rapidly, destroying much of the massive equipment. (Years later, the remnants of the canal would be excavated, rebuilt, and renamed the Suez canal - with NO credit being given to its original creators.) The Egyptian soldiers were still able to move forward, and did not worry much about this unexpected "river crossing." Sadly, they were in an area just downstream of a large dock, whose waters were about to be suddenly released due to the Minus Y2K Bug confusing its timing system. A 10-cubit wall of water (about 30 feet) washed over the armies, wiping them out entirely. Moses took credit for the disaster, impressing his people once again. Moses became a hero, and led his people on a 40-year journey, promising exciting new software upgrades that proved to be vaporware, except for a couple of hardcopy tablets that weren't executable files - at least not for many of his people. Frustrated by the difficulties of promoting new software in the absence of the technological infrastructure that Egypt once offered, Moses repented of his programmer/hacker ways and turned to religion, becoming one of the greatest religious leaders of history. In Egypt, a new dynasty arose that did their best to wipe out the residues of the technological age that had made Egypt so vulnerable to disaster. Electricity, computers, pizza ovens - it would all go. Few disasters in world history caused such massive harm. But there was a positive effect of Minus Y2K on Egyptian culture. Hunk-Amen-Ra's mother, Nut-Tut-Tut, the aging high priestess of the official Egyptian state religion, went in for her annual check up at the royal "HMO of the Gods" and was turned away. According to the HMO's computer, Nut-Tut-Tut was no longer 99, but was now 00 years old - and her physician didn't do new borns. Nut-Tut-Tut was deeply moved. Born again! Young again! Endless life! She became the first born-again pagan, and her new-found fascination with endless youth and immortality soon became a theme that would dominate Egyptian religion, art, and philosophy for many centuries. The few remaining Hebrews in Egypt (the ones who forfeited their futures with IBM and the promised land to retain their PharaohSoft stock options) would accuse her of religious plagiarism, but what could they do, sue? They were soon assimilated. Stop the uninformed hysteria about the Y2K Bug! Thanks to the Minus Y2K Web Page, now we can all have INFORMED HYSTERIA. Get informed - and get hysterical. Actually, once you are informed about Minus Y2K, you'll see the Y2K Bug brings pros and cons. Yes, on the con side, the Y2K Bug could end civilization as we know it, cause many to die and suffer horrible fates, and decrease the value of our pension plans by over 25%. But on the other hand, it just might offer a taste of freedom to those of us who are slaves to our computer masters. And who knows? Maybe it well help a few people get religion. You depict Maat offering an upgrade to Hathor, implying that the machine in question was not mY2K compliant. This is a common misconception among cryptoarchaeologists; the machine depicted is in fact a Macintosh and was therefore a cure for the mY2K problem, not the cause of it. However the Egyptians, in consulting the Islamic prophet Adam (via an ingenious prophet-sharing system), took him at his word when he told them to avoid apples at all costs. Hence the dangers of accepting verbatim the words of someone thousands of years dead, and behaving as though those words are relevant for your time as well. 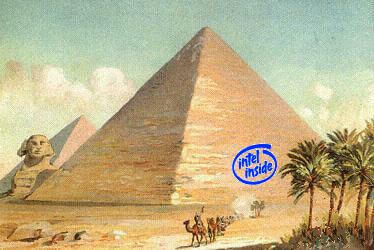 If the Egyptians had been running Mac technology instead of Windows, their civilization would not have collapsed. Sock Monkeys: Often viewed as a curse, the Sock Monkeys page claims they are the cure to Y2K. But as your humble Webmaster, Jeff Lindsay, has discovered, the ancient Egyptians also tried using millions of sock baboons to rewrite millions of lines of code randomly, hoping to find a cure to Minus Y2K once Moses explained the looming threat. But it was too little, too late.... Nevertheless, Egyptian art that survived the Minus Y2K backlash shows great reverence for the sock baboons, often depicted worshiping the sun or related Sun hardware. Serious info and lots of it, with some fun stuff, too. He's author of Time Bomb 2000. Ed has since passed away, sadly, but thanks to Archive.org, his Y2K insights live on. Say, are your kidneys Y2K compliant? Get them tested today!